snowdeal.org > ex machina: the eric update - day 287: not a day at the beach. or underprepared for spontaneity. the eric update - day 287: not a day at the beach. or underprepared for spontaneity. going to grand haven on a sunny and warm sunday afternoon in april seemed like the perfect idea. although it was a little late in the day ( well, 3 p.m. is late in the day when The Four Bees start at 6 p.m. ), it wasn't too far of a drive and odin probably wouldn't have fun more than an hour or two anyway. so, in a fit of spontaneity, we drove to the beach. we discovered our first mistake was not bringing any cash with us. as it happens, the park does charge for parking, even though it's so early in the season. so we had to find parking on the street, away from beach, which means we're already wasting precious funtime minutes. once we parked and put odin in the stroller, we discovered mistake number two - not remembering and preparing for the lake effect. it felt five or ten degrees cooler at the beach, which was just a bit too cool for odin's barefeet and short sleeves. odin's bag was definately not packed with cool weather in mind, as we didn't have socks or a spare set of pants. not even a blanket! but it wasn't like it was frigidly cold, so we decided to take a short stroll, find a bathroom and see how things played out. after walking for 5 minutes, we discovered mistake number 3 - assuming that the facilities would be open and operable so early in the season. a stranger thought that there might be one some distance away, but they couldn't remember for sure. as we set out to find a restroom, odin began to let us know that he wasn't really pleased with our decision making, just as it was becoming apparent to both kris and i that not finding a bathroom was not really an option. i guess, in a certain sense, you could say the pressure was building to find a bathroom - fast - before things quickly went from bad to worse. as we approached where we thought the bathroom should be which looked suspiciously vacant of patrons in need of relief, our eyes both focused on a small building nearby with a long queue. i'm fairly sure that at that moment we both realized that our first trip to the beach was actually going to consist of walking back and forth across an asphalt parking lot and standing in line for what was likely going to be a Very Unpleasant Experience. predictably, while standing in line, odin let us know that he no longer understood why we weren't doing our job as parents by keeping him warm; by the time we were each finished with the Very Unpleasant Experience ( each person who exited the single stall left with a similar grimaced expression on their face ) it was clear that it was time to call it a day and head home. of course, at this point odin was so thoroughly flummoxed with the situation that the ride home was less than pleasant. certainly this is a tale that any parent could tell; but it's still a little suprising to find yourself in the middle of a tailspin, underprepared for the effects of your own spontaneity, wondering when it will happen again and if you'll get lucky enough to remain so relatively unscathed when it does. 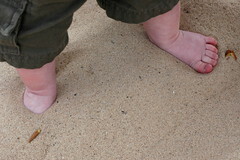 So where did the very sweet picture of his feet in the sand come from? i took it in the grand haven state park which, appropriately, is in grand haven, michigan.